The history of sunflower cultivation is a fascinating journey that spans the globe. 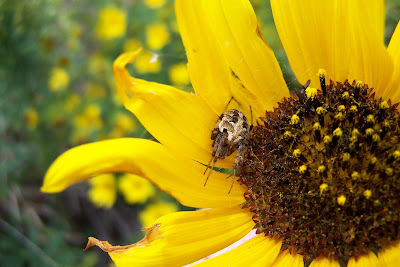 Wild sunflowers are native to the Great Plains Region of the United States. Sunflowers are disturbance specialists - meaning that they thrive in areas that experience some sort of soil disturbance. Today wild sunflowers are found along roadsides, in crop margins and abandoned fields, and within railroad right-of-ways. It is likely that early in their association with humans, wild sunflowers could be found growing in the disturbances created by the Native Americans. Around 2000 B.C., it is believed that sunflowers arrived from the Great Plains to what is now current day Kentucky and Tennessee, where the first cultivation of sunflowers occurred about 500 years later. These cultivated varieties were probably not too different than the wild populations. Native Americans continued to utilize sunflower seeds, mainly for the oil they produced. It was not until the 1800's in Russia did breeding create the giant. single-headed varities that are commonly planted today. Why Russia? Why did this North American plant species become fully domesticated in Russia? It all has to do with religion. The Eastern Orthodox church has very strict guidelines about what can be eaten during the Lenten season. Forbidden are most sources of fats and oils. But, because sunflowers were not known to the church when these rules were written - sunflower oil was not forbidden by the church. So, the Russian people breed sunflowers to produce oil. In the early twentieth century, the Russian varieties of cultivated sunflowers were brought back to the United States. And since that time, the acreage of farmland in sunflower production has increased. I see more and more uses of sunflower oil - for example, Lay's chips has new packaging proudly proclaiming their use of sunflower oil. The darker side of sunflowers??? Sounds interesting!